August 12, 2018: Molveno is an exceptional timepiece that extends beyond the ordinary with an incredible multi-dimensional dial enhancing an elegant design, which is exclusive to Cerruti 1881. A wealth of complex textures and meticulous details are fused in harmony to create the functional timepiece that exudes charisma and style. The date window is nestled in the black sunray dial, which boasts a graceful IP rose gold top ring along with a polished and textured crown. 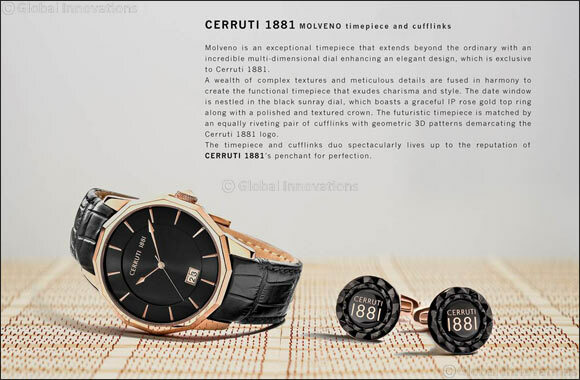 The futuristic timepiece is matched by an equally riveting pair of cufflinks with geometric 3D patterns demarcating the Cerruti 1881 logo. The timepiece and cufflinks duo spectacularly lives up to the reputation of Cerruti 1881’s penchant for perfection.